What types of Weeding Tools, Weed Pullers, Weed Poppers, Weed Twisters, Weed Hoes or other Garden Weeders do You Need? Special Weed Problems in your State or Region? How Big are your Weeds? Match your tools with the most troublesome weeds in your garden or state... Need a Back-Saving Solution? How many different Weed Twister Tools are there? How to select a matching drill (not free!) for garden augers and twisters? In gardening and farming today there's a buzz about new techniques and tools for organic crops, permaculture, sustainable agriculture and improved safety, including no-till and low-till practices. You may be curious to know if there is anything really new in the weeding tool department to go along with a new commitment to freshen up your garden or perhaps create a new native plant garden from a converted lawn. With that in mind, you may be ready to upgrade your conventional (old fashioned?) hoe to a more precise hoe and/or weed puller or twister that protects your herbs as well as your soil from excessive tilling. Perhaps you're ready to put aside your habitual herbicides to come clean from chemical dependence. You may also be curious about ads and commercials for different types of weed twisters and augers that promise to save you time and save your back, as well. We think you will be pleasantly surprised by several really cool tools that may be new to you and to many others who haven't yet ventured beyond the traditional hoe and dandelion digger for defending against weeds. Do you need more diversity and power in your weeding tool arsenal? Weeding wisdom: Mulch preventive, Twist defensive - Stow the Hoe until you Sow! Do you need to remove weeds by their roots, or simply whack off their tops? To help you get a hold of the weeding tool marketplace, we begin with a way to more clearly describe and classify all the types of hand tools for weeding so that you understand the difference between a weed twister, an auger and a twisting cultivator, or a weed popper and weed puller. This will help you see through the hype of commercials and look for the types of tools that will help you the most based on what's actually going on in your garden and the way you prefer to work with weeds. While reading this page, we suggest you turn off your TV infomercials! Chances are you are beset with weeds of a variety of different types, sizes and shapes. By choosing the right tools, you will be more successful in matching up with your most stubborn weeds. With two or three carefully selected hand tools, and a little work, you will be able to protect your precious herbs and crops without the need to resort to a chemical overkill. A good tool match also must consider the size, shape and placement of the plants you're trying to protect. Wouldn't it be nice to find some tools to save your back and save some precious time as well? Different weeders for different weeds! Compare features and prices! Most gardeners need special tools designed to work effectively within each of two or three of the Weeding Tool Terrains. For each terrain you may need one or two tools to match up with specific preferences, weeds, situations and types of plants you need to protect. In some large or complex gardens, four or five terrains may need the attention of appropriate tools. Since twisting weeders are hot on the market today, we talk a lot about the Ergonica Weed Twister, partly because we manufacture and sell this tool and also because many people have seen ads about this and similar products and need to know how this twister differs from other twisters numbering about a dozen or more. This twister also deserves special attention because its unique design allows it to cross over into several tool type classifications, making it an exceptional multitasking helper! For example, in one terrain this tool can very effectively twist out crabgrass and bermudagrass, which few, if any, other tools can do, earning the nickname Crabgrass Twister and in another terrain can also uproot small tree sprouts such as the Ailanthus altissima with roots as long as 12 inches and more. A number of specific weed twisting tools from various manufacturers and others with little or no twisting options are also compared in some detail below. Very popular weeders such as weed poppers with foot levers, hula hoes, string trimmers and other varieties are also presented and compared in some detail. We also offer for sale a number of competing products from various affiliates to keep everyone honest and allow you to conveniently compare prices and detailed weeder features including comparisons with several Amazon marketers. Amazon comparisons can sometimes provide better customer reviews than other selling platforms but you may sometimes find better prices from different marketplaces which you may see in our comparisons. Are you using the Wrong Weeders for Your Weeds? Or Your Needs? Need a Better Match to Remove Your Weeds Quick and Easy? Weed Twister - the Big One! A better match starts with a clear picture of your weeding tools mismatch issues. If you're facing some of the problems on this list, be assured that there are better matches for your weeds and needs identified on this page. The old conventional hoe and other traditional weeding tools are suitable for certain situations but just weren't designed to match many of the technical and personal problems faced by homemakers, retired folks and organic farmers today. The older you are, the more you may need newer, more efficient tools. The concepts of ergonomics, convenience, multitasking, organic gardening or low-till farming were not relevant to traditional tool manufacturers. More effort has been devoted by large corporations and professional engineers to designing heavy machinery and chemicals for modern agriculture than to making handy garden tools and organic solutions. The most innovative, problem-solving weeding tools today are made by smaller companies and entrepreneurs. In the technical arena for hand tool weeding, as many as eight weeding tool classifications, each ordinarily served best by different tools (with some exceptions), can be seen in the Weeding Tools Terrain Hierarchy chart below. To be fair, we try to give a balanced view to clarify all the twisting and non-twisting alternatives. We also sell many of the competing twisters and other tools on this website, because we firmly believe that just one type of weeding tool for the average garden or farm just won't cut it! Different weeders for different weeds! Early spring: Most gardeners and farmers want to remove small uninvited sprouts, suckers and seedlings as soon as possible by their roots, before they go to seed. This will clear the weed pressure for later seasons when your annual plants and crops are more sensitive to herbicides. You don't want to spray herbicides around blossoms, vegetables, carrots, onions, etc., especially after they are mature and ready to harvest. If you use the tools available for pulling or twisting out early spring seedlings by their roots, you will reduce or eliminate the need to invest in heavy equipment, weed whackers and / or herbicides. Hoes can also work on small seedlings, but be sure that all roots are removed. In farms and regions where irrigation and precipitation is abundant year round, you may need to use deep-root extracting tools, twisters and pullers in all seasons. Rainy seasons start the promise of weeds and the advantage of tools that twist into the soil. Mid-summer or fall: Your requirements may extend to weeding tools that are capable of penetrating deeper than 4-6 inches to remove the tap roots of vigorous late-season weeds such as mallow or dandelions, for example. If allowed to mature for more than six months, the roots of many annual and biennial weeds can extend to 12 inches or more deep into the soil. Hoes and many foot-lever tools are not designed for mature deep-root extraction at this time of year. The main question here is to select the tools that work well for your types of weeds, your personal preferences or body requirements (ergonomics), and, especially for farmers, the most efficient tools that do the job quickly and safely for their workers and their crops (high precision tools). Is this your season of reason? Can your work benefit your environment? Weeding Tools Terrain Hierarchy: This is a table that describes from left to right the major plant types by size and shape, tool types appropriate to each plant type, terrain targeted by each tool type, and finally the application of the exceptionally versatile Ergonica Weed Twister within each terrain. This hierarchy is sorted from the top down with larger plants at the top of the chart and upper portions of these plants placed above the lower portions and roots. At the base, aquatic weeds are included as one terrain, although this terrain, and possibly others, could logically be refined to more specific terrains or sub-categories, such as different types, shapes and sizes of weeds within each terrain. For example, the aquatic terrain may be further subdivided into major plant communities: emergent plants, floating-leaved plants, submersed plants and deep water. The codes from A thru H are provided on the leftmost column for convenience in comparing specific tools in the Weeder Features chart below. Neither the codes nor hierarchy of terrains is endorsed by any industry standards. These groupings are intended solely to give the consumer a practical guide in selecting appropriate tools that match the weeds they most often need to contend with. Hand held weeders that remove individual plants by their roots are known as weed pullers and weed poppers or more generally as weed removal tools. Weed twisters also fall into this classification. Other terms often used for weed pullers are weeding tools, weed tools, weed diggers, weed knives, weed uprooter tools, weed pluck tools, weed cutter tools, weed pulling tools, weed puller tools, weed removing tools, weed remover tools, weed extracting tools, weed removing devices, weed clearing hand tools, garden weed pullers, manual weed pullers, weed twist, twist weed, garden twister tools, weedtwisters, cork screw weeders, weed removal claws, weed shovels, tree pullers, root pullers, uproot tools, grass weed pullers, dandelion pullers, dandelion diggers, dandelion knives, dandelion poppers, dandelion tools, dandelion extractor tools, dandelion removing devices, crabgrass removal tools, crabgrass tools and various combinations of these and similar terms. These terms may also be useful when searching for specific tools on the web. As we will explain, these tools have a number of different features and several offer unique designs to pull out roots in different ways as is suggested by the many different names by which they are called. Each puller has to provide a means to penetrate the soil and / or to grab or remove the root in some way. Some are complex tools with moving parts, although most have no moving parts. A few of these tools also require motors of some type, such as a power drill, for example. Some of the weed pullers are also designed specifically to remove deeper and larger roots than others. They also differ in the length of their handles and the ability to lift the removed plant above the ground to avoid additional cleanup. Many interesting and diverse tools are included in this group. Hand cultivators, like forks, claws and hoes for example, are also weeders used primarily to remove numbers of small seedlings in patches by partially uprooting them and cutting their stems at the base. Hoes and claws-forks are cultivating hand tools in contrast to larger tractor-mounted cultivators or cultivating machines. Hoes usually have long wooden handles and are often designed to specialize in weeding larger or smaller areas by the size and shape of their blades. The Free Dictionary defines cultivator as "An implement or machine for loosening the soil and destroying weeds around growing plants." In a sense, weed pullers, as described above, are designed to surpass the limitations of hand cultivators by removing weeds more precisely or with deeper penetration for larger roots, or both. Cultivators are also tillers and may be used for aeration and irrigation control, as well. The pros and cons of using cultivators for weeding will be explored more thoroughly below. String trimmers and Weed whackers are power tools that work above ground to cut the stems of grassy weeds. These tools generally use a rapidly rotating string or stiff element to directly assault the stems of relatively small grassy vegetation. In recent years a number of manufacturers have developed cordless electric trimmers with batteries that can last an hour or more before recharging. Industrial applications generally use more powerful trimmers with gasoline motors for clearing weeds in large areas. Each of these tool type groupings fits into one of the eight weeding tool terrains described above. The U.S. Patent and Trademark Office eliminated the category of weeders years ago. But that didn't discourage many creative gardeners from coming up with new weeder inventions and occasionally acquiring patents, to the benefit of the increasing number of gardening enthusiasts. These are generally categorized as mechanical weeders. Mechanical weeders and hand tools are becoming more popular today partly due to the increased interest in organic gardening, sustainable gardening, integrated pest management, permaculture and the nationwide Master Gardener movements, all of which which discourage the use of toxic chemicals for herbicides and pesticides. The wide use of herbicides is largely due to the convenience of using chemicals to curtail the growth of weeds or to kill dandelions and other weeds from lawns and other large areas. Chemicals can kill plants (targeted or not), but they can't remove them. So, you're left with dead plants that look unsightly and still need to be removed after chemical poisoning. Some gardeners have not found a practical tool to remove dandelions without a great deal of stress on their backs and limbs. You may be dealing with the same problem yourself and hope to find a practical alternative to using toxic chemicals on this web site. Whereas dangerous chemicals may be economically advantageous on the farm where productivity can make or break the farmer's success, there is little economic value to horticulture and ornamental gardening to offset the risks of applying these killing agents around children and pets at home. It doesn't make much sense to select premium organic veggies at the market and take dangerous pesticides for your herb garden in the same shopping cart! The subject of the economic tradeoffs of herbicides in agriculture and ornamental gardening is more thoroughly discussed on the Weed Twister vs. Roundup web page. If you need a little help to kick the herbicide habit, see the 12 - Step Herbicide Detoxification Program. The good news is that there are several mechanical solutions to removing dandelions from lawns and removing other types of weeds with very little stress on your back and limbs. Each tool has different advantages and may focus on different plant removal situations. Most tools do what they claim to do fairly well. Some claim to do a lot of different tasks in various situations. Others focus on just one task in a specific setting. Sometimes a feature for one advantage may cost the loss of other advantages, such as longer length causing more weight, for example. Here we describe each feature as it applies to a class of tools and the pros and cons that apply to the features and tools in each class. The most attractive feature driving the mechanical weeder market today is the back-saving feature. The minimum requirement for this claim is a long handle that extends for 30 inches or more. The short handled hoe, for example, is infamous in agriculture for damaging the backs of work hands on the farm. Many states now require that a hand tool for agriculture have a length of at least 48 inches to protect the health of farm labor. See the Hand Weeder Science page for more tips on agricultural solutions. The Weed God, if there is such a thing, does not demand that you genuflect on the hard soil every time you wish to remove an unwanted plant! If your body and the plants in question are in conflict, you have to decide how much pain you really need to invest in clearing or removing the weeds. Generally speaking, the longer the handle, the easier it is for your back. For example, the Ergonica Weed Twister gives you a choice of several lengths from 36 to 60 inches that you may choose based on your height and the need to reach away from your path or around various obstacles. Additional features to classify weeders are the ability to lift up the weed after uprooting it, to till the soil and to dig small holes. Some long handle weeders are designed for precision, which usually means that the width of the active element is limited to around 3 inches or less. The short-handled hoe, also known as el cortito, was banned for agriculture in California in 1975 due to painful back trauma for farmworkers. The minimum length for weeding tools on the farm was thereafter set at 48 inches. To qualify for lawn use, the weeder mechanism must have an even greater precision with a width of 2 inches or less. Minimal soil disturbance is another important feature that is generally associated with high precision. Also known as no-till or reduced-till, minimal soil disturbance helps to reduce the promotion of latent weed seeds in the soil. It also tends to keep important nutrients and organic matter in a healthy state near the surface of the soil and reduce soil erosion. This is critical to permaculture and other polyculture techniques. Some tools are light enough to be able to be applied with only one hand. This applies to most short-handled tools, but also to a select set of long-handled tools. A short-handled tool that requires one hand on the tool and the other on the plant for control, requires more stooping and stress than one that allows the other hand to be free. Light-weight tools are more ergonomically friendly than other heavier tools that require the use of both hands, or those that also require the use of the foot for implementation. To increase length and still keep the weight at a minimum, under two pounds, for example, is pushing the limits of ergonomic value. Eliminating the requirement of using your foot reduces stress even more and allows you to reach further from your path. Most tools with foot levers and moving parts are also heavier and more awkward to carry around than other tools. 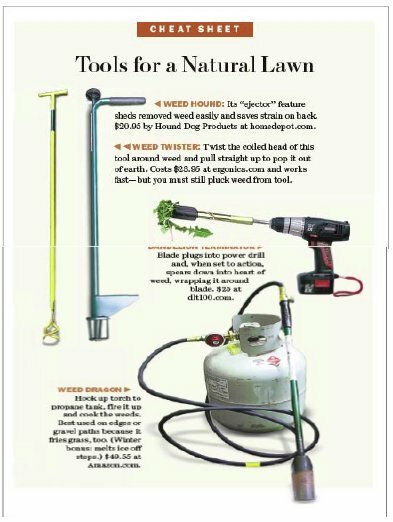 Several varieties of multi-prong weed pullers and weed poppers also compete for the back-saving market, with brands including Hound Dog Weed Hound, Fiskars Uproot Weeder, and others compared in the Weed Twisters Comparison section on the next page. These devices provide the convenience of a foot lever that presses the prongs together or lifts the prongs to grab the roots beneath the soil to a depth of about 3 - 4 inches. The main limitation of these tools is the length of the prongs which limits the depth of penetration and the size of the root that can be effectively removed. Compare this with some twisters that can reach deep into the soil for long roots as deep as 6-12 inches or more. If you have a lot of fairly small dandelions in your lawn, this type of tool could be a useful addition to your weeding tool arsenal. These are not light-weight tools, like the Ergonica Weed Twister (about one pound), for example, and cannot be applied to areas away from your path because of the foot lever mechanism. The ejection mechanism is convenient as long as you don't need to lift the heavy tool to place the debris in a waste basket. With the Ergonica Weed Twister, for example, you can easily lift the tool over a waste basket or wagon and simply tap the tool against the container to drop the contents of the coils into the receptacle. No extra ejection mechanism is necessary, which moving parts often break in time if not well made. This saves you the extra step of picking up debris after removal. More about the Weed Twister and other weed twisting, weed spinning, weed spinner tools, including drill-driven and motorized tools on the next page. There are also a few larger tools of the weed popper class that are designed for extending a prong or set of tines deeply beneath the roots of larger plants with leverage for removal. The large weed poppers are heavier and costlier tools beyond the normal weed removal class that fall into the brush clearing category. Brush clearing tools are described in more depth below. Short handle weeders are generally designed as very precise tools suitable for lawns and other areas. We have identified a few cleverly designed short handle weeders which show the inventiveness in this category. Of course, the standard dandelion digger is the most popular short handle weeder. The "V" notched prong of this tool is an efficient design for grabbing and lifting the root of the weed below the surface. The generic dandelion weeder may be found in any retail outlet that sells gardening tools. As mentioned above, short-handled tools that require the use of both hands are not as ergonomically friendly as tools that can be effectively manipulated by only one hand. Several ergonomic short-handled weeding tools are also illustrated on the Garden Tools page. Several short-handled and long-handled weeding tools of the twisting genre are compared on the Weeder Features Chart . Some people may argue that high precision requires a short handle. The very precise long-handled weeding tools identified on this page demonstrate that there are several ways to eliminate the need for getting on your knees for most weedy situations. Save your back and knees for those few situations where the long-handled tool simply won't cut it. Why strain your back when you don't have to? Long-handled weeding tools, also known as standup weeders, are easier on your back, especially if they are light weight and can be applied with a minimum of force. Usually, the longer, the better, keeping weight to a minimum for ultimate ergonomic value. With the Ergonica Weed Twister, for example, you can match the tool length with your height and the type of work you need to do. Most hand cultivators, like hoes for example, and a number of weed pullers provide long-handle convenience. Some of the long-handle weeders have incorporated the dandelion "V" notched prong along with an appendage to provide a pivot for uprooting the weed. Another recent variation is the Stick 'n' Kick weeder that allows you to kick out your weeds with a 42-inch shaft for comfort and leverage. A larger number cultivators use a hoe-type blade shaped in a variety of ways, including a circular loop, a heart-shaped blade, and various types of angles and surfaces. Shuffle hoes are also popular weeding tools in gardening and organic farming. Tilling with a cultivator or twister requires the use of both hands and may cause more stress if the blade or mechanism requires more work to accomplish the same task. Likewise, a heavier tilling tool is a trade off of ergonomic value since the weight of the tool may make the work more effective but also more stressful, an overkill, in other words (Kill the weeds, not the workers!). Accessibility for wheelchair gardeners and seniors with arthritis is an important consideration. Some valuable tips in this regard can be viewed on YouTube demonstrated by Bonnie, who is a quadriplegic with limited hands ability. Choosing the right tilling tool for the job at hand is important to eliminate unnecessary stress. If you don't really need a heavy-weight hoe for a few small weeds in soft soil, select smaller or lighter cultivating tools or twisters that can do the job with less work and stress. The selection should also be based on the level of precision and control needed to protect your precious cultivars. Oftentimes we face a combined patch of many large and small weeds situated closely together. In this scenario it would be advantageous to select a tool that works well with both small weeds and large weeds that a hoe cannot handle, such as the Ergonica Weed Twister, for example. For busy people, this multitasking feature will save you time and a little dinero, as well. Many people buy several Weed Twisters of different sizes to work in different situations such as planters, raised beds and lawns, for example, and for different members of their family. Having a well-chosen set of cultivators and weed pullers over a range of precision and penetration in your weeding tool arsenal enables a better match of tools for the job at hand. Here we portray a good variety of weeders categorized as ergonomic, fork-hoe, long-handle, sickle-knife and torch. The discerning shopper who does his or her homework would know that you cannot find most of these unique tools, like the Ergonica Weed Twister, in local retail stores. Tree Sprouts! Several heavy-duty tools are designed to pull small to medium-sized tree sprouts, including the Weed Twister. 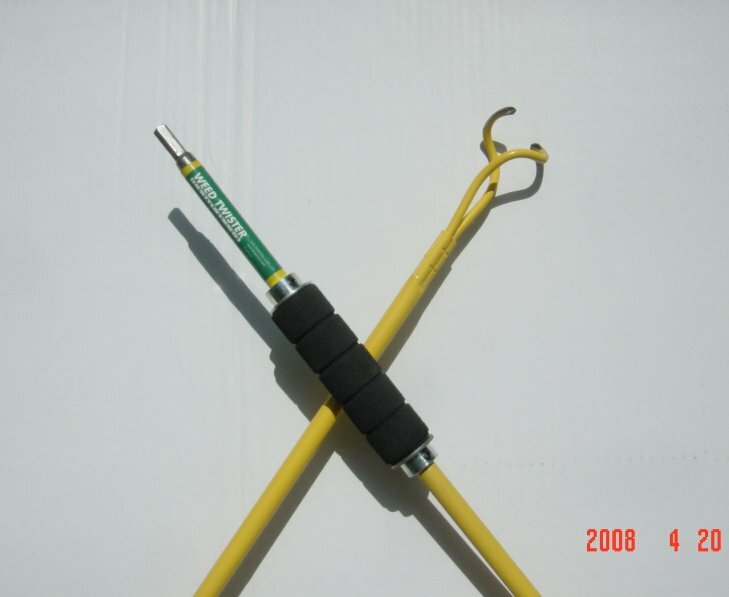 The PullerBear is also a well-known small-tree puller, as well as the Root Talon and Root Jack (compared on chart). Another contender, the Weed Wrench, appears to have dropped off the market but the Root Jack functions in a similar fashion. Most of these pullers are limited to a stem or trunk diameter of less than two inches. The Root Assassin is a combo shovel and saw, a hybrid tool that is handy to cut and uproot roots and limbs as shown here and a very similar tool called the Radius Garden Root Slayer is also available and compared on the Weeder Features Chart. For larger tree stumps, a farm jack may also be used with chains and machinations to pull tree stumps and lift just about anything as shown on this video. The advantage of the hoe-type tool in general is its efficiency for shaving small seedlings from the soil surface and uplifting small plants by the roots in soft soil. This is particularly effective for early season annuals and biennials. Some wide blades are effective for clearing and tilling a larger area. The more narrow "precision" blades are safer to use in close proximity to plants you wish to protect. Several claw tools use pointed tines in the shape of a claw to cultivate soil, a smaller version of the fork. There are also fork-hoe tools that combine both tools on the same head, as well as rake-hoe combos sometimes used by firefighting crews. The diameter of the claw for these cultivators is twice the size of the weed twisters used for pulling weeds. The limitation of the hoe-type tools and cultivators in general is that they are not designed to remove dandelions or other weeds from lawns. The one exception that we have discovered has a very narrow "V"-faced blade for extra precise weeding. Traditional wide-blade hoes are generally not recommended for organic or polyculture weeding due to the excessive promotion of latent weed seeds and damage to organic matter in topsoil. More precise tools may be used when necessary for defensive action against weeds that have persisted despite other organic weed prevention methods. The primary limitation for all hoe-blade weeders is the tendency to sever the main stem of any plant larger than a few inches, such as late season weeds, and thereby leave the root in ground to continue growing in a few days. Another shortcoming is that even fairly precise hoes disturb a lot of soil (and weed seeds) as do any of the tools with flat surfaces or large claws that are designed primarily as cultivators. Wide-blade hoes are more suitable for seasonal crop rotation and sowing rather than defensive weeding throughout the entire crop season, especially when topsoil conservation is an issue. Keep in mind that none of the hoes and cultivators are designed to lift the debris above the soil as do several weed twisters and other weed pullers, which means that the cleanup job, if necessary, is an added chore and strain on your back. If the debris includes plants with flowers and seeds, you may be doing more harm than good! Weeding wisdom: Mulch preventive, Twist defensive - Stow the Hoe until you Sow! There are several non-hoe type weed pullers for removing weeds from lawns with back-saving features. The long-handled "V" notched tools and the weed twisters are designed for this job. An "L" shaped tool works in a way similar to the twisters. A jet stream of water is used by one innovative tool to penetrate the soil and uproot the dandelions which water may come in handy when using a torch weeder to burn off the weeds. Both also compared on the chart. There are other tools on the retail market that we have not identified here. Even in their absence, you may analyze their features based on your comparison with those we describe and those identified in the Weeder Features Chart on the next page. A number of power tools designed to trim the top of grassy weeds and ground covers can be purchased in many stores and online. Some people also use lawn mowers to crop the weeds growing in their lawns. The Garden Tools page illustrates of few of the more popular weed trimmers on the market, as well as other tools and solutions for weed control. Keep in mind that whacking a weed without removing its roots may only be a temporary solution for weed control. Brush clearing tools are designed mostly for land management such as forestry and wild land conservation. Once in a while a home gardener or farmer may need a tool to cut, trim or remove heavy brush, trees and a variety of large plants and weeds. A hand weeding tool, like the Ergonica Weed Twister for example, can cross over into the brush clearing category because of its ability to pull out large weeds with a root diameter of 1.5 to 2 inches, depending on the shape of the root. The depth or length of the root can be as long as 12 to 24 inches or more for effective removal, depending on the length of the Weed Twister model. Cutting tools, of course, differ from plant removal tools, and include a variety of axes, hatchets, machetes, saws (chain saws, hand saws, pole saws, reciprocating saws), and other similar tools as well as tree pruners. A number of brush cutting tools and brush removal or clearing tools can be found on the web by using your favorite search engine. For example, the PullerBear and several weed poppers are designed for the removal of large plants and small trees as described in Tree Sprouts above. Most of these larger plant removal tools are heavy and expensive, costing about twice as much as gardening hand tools. Examples of these heavy-duty tools include the Weed Wrench and Root Talon. For this reason, land managers may consider a tool like the Weed Twister to more efficiently remove weeds that do not require the extra overhead and ergonomic stress of larger tools. The Weed Twister also makes a handy walking staff because of its light weight and T-handle which is convenient for land management outings for identifying and removing invasive weeds. For even larger plant and tree challenges, there are tractor-mounted devices that can rip out mature trees, grind out tree stumps and dig deep into the soil with augers to remove whatever lies within their paths. The web is an excellent resource to help you do your homework and learn about new mechanical solutions to land management (and weeding) that may dynamically change from year to year.